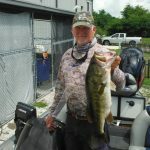 This week on Lake Okeechobee the winds have been light and we have had to dodge a lot of thunderstorms. Water temp has been in the high 80’s and the water clarity has been good in most areas of the lake. There are a lot of fish on the outside edge of the kissimmee grass in the morning. The best bait this week has been the Strike King Swim Jig and a War Eagle Spinnerbait, color doesn’t seem to matter. Good areas for this are Tin House and Indian Prairie. Move pretty fast until you get in to them. Then start flipping when the sun gets high. This method has seen some great results.